Choosing the right motorcycle helmet is one of the most important decisions, you the motorcyclist, will ever make. The choice between a good and a bad motorcycle helmet could be fatal. Yet don't let that put you off. All new motorcycle helmets for the UK and European market have to conform to ECE 22.05 standard. Most manufacturers exceed this standard. ECE 22.05 requires a helmet to survive one single impact on five specific points at a speed of 7.5 metres per second (m/s), equal to 16.77mph, Snell require two impacts. Some manufacturers test to four impacts on the same point and at nine different areas and added to this they still conduct a penetration test which ECE 22.05 does not require. 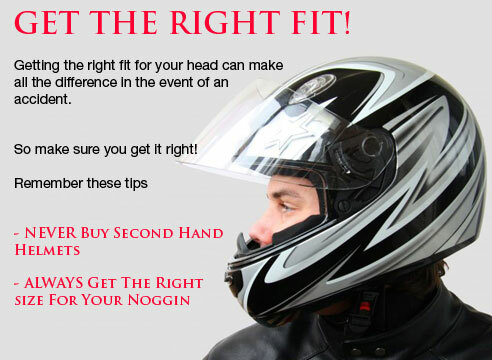 This is to ensure that you as the rider buy the best motorcycle helmet for you, offering maximum safety. When purchasing a motorcycle helmet ALWAYS make sure you have the correct fit. Whether you are purchasing a top of the range motorcycle helmet or a cheaper alternative, getting the right fit is crucial for any motorcyclist. A poorly fitting motorcycle helmet could be extremely dangerous to the motorcyclist if in an accident. Always get the dealer to measure your head so that the correct motorcycle helmet is bought. Here are a few tips for maintaining your motorcycle helmet. If you drop it, take it your local dealer, to check to see if it is still safe to use. A damaged motorcycle helmet is as bad as a poorly fitted one. Keep your motorcycle helmet clean, using warm water, trying not to use harse chemical products to do so. Carry your helmet via the fastening strap. Depending on whether you have a polycarbonate helmet or fibreglass you should always replace your bike helmet every 3-5 years.